A woman in a long skirt makes her way up the steps, where a plaque reads “ritualarium.” The door opens and another woman, her hair tucked into a velvet cap, smiles warmly and ushers her in from the wintry night. 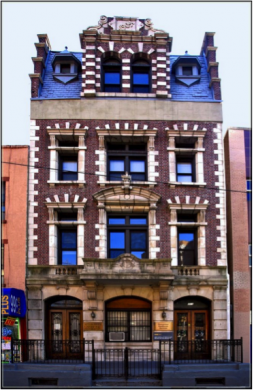 The building that stands at 311 East Broadway today was commissioned by the Young Men’s Benevolent Association, a community organization established in the 1890s. After a sixteen-year fundraising effort, the Association hired the architectural firm Sass & Smallheiser to construct a five-story building for $35,000. The building’s use over the past century mirrors its “mixed breed” exterior. Its first 14 years were spent as a community center with a strong political spirit, its next 18 as a social settlement house for new immigrants facing the struggles of tenement living. And for more than 70 years, it has served as a Jewish ritual bath – the last remaining on the Lower East Side. Many believe it to be the oldest continuously operating mikvah in the United States. David Blaustein, then president of the Educational Alliance, spoke at the celebration. “Your organization has sprung directly from the people of the Lower East Side,” he said, “…You, or your parents, have come from countries of oppression where there were no opportunities for our race. In this country, we can proclaim aloud and without fear that we are good Jews in order to be better citizens.” The new building held a library, reading room, bowling alley, gymnasium, billiard room, showers, and an auditorium that frequently hosted lectures. 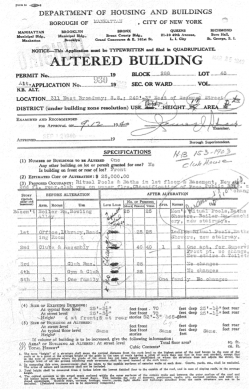 In 1918, 311 East Broadway found a second life as a social settlement house. At the heart of the operation was a woman named Rose Gruening. Gruening was born in 1876 to Rose Fridenberg and Emil Gruening, both German Jewish immigrants. The younger Rose’s mother died of typhoid fever during childbirth, and her father soon remarried her mother’s sister, Phebe, with whom he would have four children. In Robert David Johnson’s book on Rose’s brother, the author describes the Gruenings’ childhood as very privileged. Their father owned three houses on 23rd Street, one of which he used as his medical practice. The family was not religious, but Emil was involved with several benevolent associations and strongly encouraged his children to pursue public service. Rose attended the Ethical Culture School on the Upper West Side before going on to Vassar College. After graduating, Rose volunteered as a social worker at Madison House (now the Hamilton-Madison house), the settlement associated with the Downtown Ethical Society. 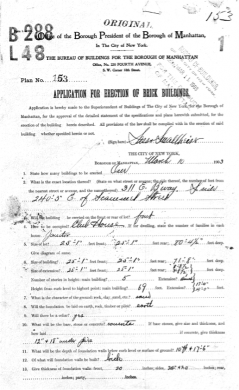 Seeing that Lower East Siders required more help than Madison House could provide, Gruening and some of her colleagues, including Samuel Null, who later became a Supreme Court Justice, went on to found another settlement house at 257 Division Street in 1916. They called it the Arnold Toynbee House after the British economic historian and social reformer whose work inspired the first ever university settlement house, located in London’s East End. The settlement house was also home to a rooftop garden, a bowling alley, pool tables, and an auditorium that hosted concerts and dances. In a sense, the building continued to host activities not unlike those of the Young Men’s Benevolent Association – the primary difference being that once it became a settlement house, these things were available for free. 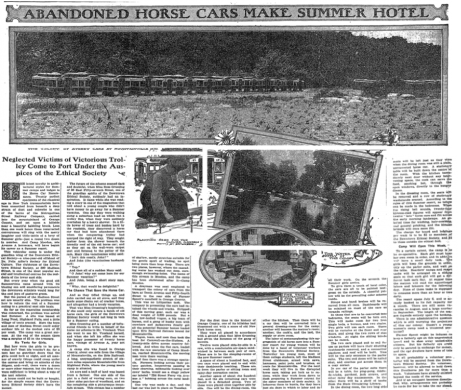 The fact that, despite limited funds, the settlement made an effort to provide such activities indicates that Gruening and her colleagues recognized the importance of leisure. 311 East Broadway hosted performances of works like “Macbeth” and “Julius Caesar,” and clubs and classes dedicated to art and literature. Diner believes that such offerings spoke volumes: “If your only concern is going to work, stoking your body with enough calories so you can go to work the next day, you’re not going to take an art class. And what was really amazing was the number of people who took these classes – young working women who would take courses in literature and history and political theory.” Beginning in 1928, the building also housed a women’s college, the Hebrew Teachers Training School for Girls, later part of Yeshiva University. 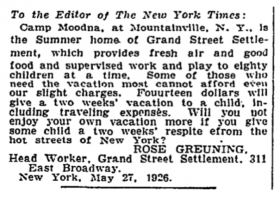 Gruening sought funds for Camp Moodna (New York Times 1926). 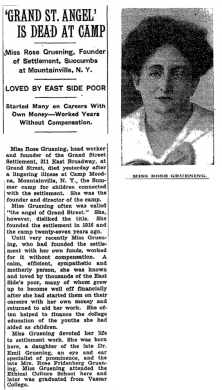 Gruening was remembered for her settlement work, New York Times, 1934. In 1936, the Grand Street Settlement moved to a larger space at 283 Rivington Street; the building had become “inadequate” and been condemned by the Fire Department. Now located at 80 Pitt Street, it continues to serve more than 10,000 people each year. The building today holds its most traditional role yet: it is home to the last remaining mikvah on the Lower East Side. The Agudath Taharath Mishpachah (Association of Family Purity) bought the building and turned it into Jewish ritual baths in 1941. 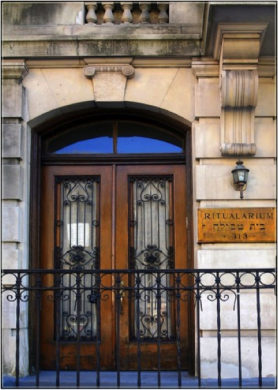 The building is now labeled “ritualarium,” an English approximation for “mikvah.” The mikvah’s purpose is purification, and while it is most commonly used by women after menstruation, it is also used by men and women for conversion to Judaism, before certain holidays, before marriage, as a way to celebrate, heal from trauma, or mark a life transition. A woman typically visits the mikvah in the evening, washing and grooming herself very thoroughly upon arrival. Once she is clean, the woman proceeds to the mikvah pool itself, and descends into the water, immersing herself completely three times. In her book New York’s Jewish Jews: The Orthodox Community in the Interwar Years, Jenna Weissman Joselit, a professor of History and Judaic Studies at George Washington University, describes a series of “mikvah manuals” written for women in the 1920s and 30s, urging them not to abandon the tradition. The primary purpose of these manuals, Joselit explains, was to convince women that the mikvah still held a valuable place in their lives by appealing to contemporary concerns about mental and physical health, beauty, and marital happiness. But resistance to the mikvah was not purely ideological; many mikvahs in the city had fallen into such a state of disrepair that the Board of Health labeled them a menace to those who used them. This led to the establishment of a Mikveh Owners Association which pushed for specific standards of higher sanitation: mikvah waters needed to be changed regularly and disinfected with chlorine, bathers needed to clean themselves well before entry, towels needed to be sterilized. Beginning in the late 1930s, a series of “model mikvahs” began to go up around the city; not only were they built to conform to city health and sanitation codes, but they were attractive and modern, with private pools, tiled floors, and dressing rooms with hairdryers and toiletries. The mikvah on East Broadway was one of the first in this tradition. The Hebrew word “mikvah” means “collection of water,” and according to the Talmud, mikvahs must contain “living water,” water from a natural source. When the Lower East Side mikvah was established, its proximity just a hop and a skip from the East River made that the logical water source. But hopping and skipping isn’t so easy with enormous quantities of water, so the mikvah transported chunks of ice from the river by wagon. The mikvah shifted from river to rainwater about sixty years ago, collected on the same rooftop where children played during the building’s settlement days. Under the supervision of mikvah President Dr. Aaron From, the building underwent a major renovation in 1996. Today, the building has an interior of homey pink tile. Its plastic-covered chairs and vase of silk flowers give it the unpretentious feel of a great-aunt’s living room. It’s not as fancy as some of the newer mikvahs uptown; that, says Dr. From, was part of the idea. “We want the mikvah to be accessible to everyone in the community,” he says. “We wouldn’t want cost to prohibit someone from coming.” While many modern mikvahs charge up to $40 per visit, the one on East Broadway requests a suggested donation of $10. In order to maintain the mikvah, the building rents out commercial space to several tenants, among them the offices of the popular art digest e-flux. As David Rosenberg, a Research Coordinator at the Center for Jewish History, points out, “The fact that it still exists is significant.” Without community use and support, the mikvah would likely have gone the way of the neighborhood’s kosher restaurants and yarmulke shops — shuttered, or at the very least Brooklyn-bound. Wonderful article! I am proud to say that I’ve used this Mikvah and didn’t know half of the history you provided here. I can now see how incredible this place was and for our people. 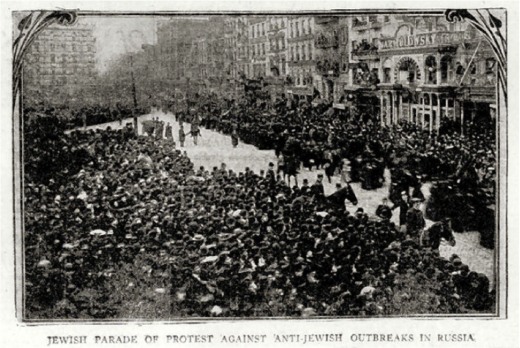 Next time I will feel even more connected to this ancient tradition and my American Jewish roots in New York. 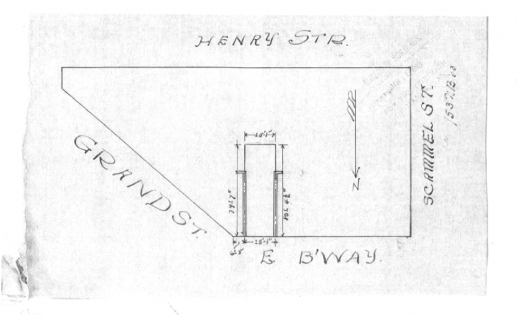 Thank you for a great article about the history of 311 East Broadway. Might I add to it as I worked in the building as part of the staff of Gouverneur Healthcare Services. The staff provided many outreach services to the immediate community including the homeless in subway stations and tunnels. There were even staff that provided psychological counseling to community members affected by the 9/11 attacks. I guess you could say that Gouverneur continued the long history of serving the needs of the neighborhood.